Yellowstone is full of tons of geothermal activity – and with so many geysers and hot springs in such a big park, which ones are the best and which are the ones that you can skip? It can be really overwhelming if you’re not familiar with the park, which is why we’ve put together this guide! This is a list of all the (or at least all of the must see) geysers and hot springs in Yellowstone based on their geothermal locations. It seems like everywhere you go in Yellowstone there’s a geyser. There are so many that we couldn’t list every single one because there are over 10,000. But not all geysers are created equal – some are not accessible and some are just some bubbles on the side of the road that you might not have even known they were there. SOme erupt consistently which others haven’t erupted for years. If you really want to see a full definitive list, there is an interactive map available here that shows ALL of the thermal features in the park. This is way more detailed than you would ever need for visiting purposes, so in this guide, we’re just focusing on highlighting the “must see attractions” that are the most visually impressive to visit. There are 8 main geyser basins that are a hub for geothermal activity. You can explore these basins via boardwalks or paved trails where each of the features highlighted below are very clearly marks (there are map and wooden signs telling you what is what). You will probably not be able to visit all 8 areas in one day due to the sheer distance between them. This entire area is full of tons of geysers – it’s literally the largest cluster of geysers in the world (over 500), so if you’re only making one “geyser stop” this should be it. There’s a long boardwalk that goes through the entire area making it easy to meander between geysers. You’ll be amazed at how many are in this area. Oh, and don’t forget to watch out for the occasional buffalo hanging out alongside the boardwalk. Kinda a must-see when visiting Yellowstone as it’s basically the most famous thing in the park. It erupts every 44 to 125 minutes, with an average of every 74 minutes. So if you have about a half hour to kill waiting for it to erupt, there’s a good chance you’ll see it. Eruptions are around 150ft high and last for up to 5mins. It’s cool to see, but also very crowded as you can imagine. This is at the start of the boardwalk trail that passes through the whole basin, so you can walk around and see some of the other smaller ones while you’re waiting if you want. Eruption prediction times here. A geyser that erupts out of a 4ft tall cone, which acts as a nozzle shooting water up to 180ft in the air. Eruptions usually 1-3 times a day and can last for up to 5 mins, though it’s not very predictable when they’re going to happen. It’s one of the tallest geysers in the park, which makes it worth seeing if you’re able to catch it. Eruption prediction times here. The sinter deposits around the hole has caused this geyser to look like…. well, a castle – hence the name. It’s a pretty large geyser just at the base and can erupt up to 90ft in the air. It’s somewhat predictable erupting every 8-14 hours. Even when not erupting, it’s usually spitting out good amounts of steam which makes it something to see even without the water works. Eruption prediction times here. The tallest known predictable geyser erupting every 7-15 hours hitting up to 150ft high. It’s quite a sight if you’re around to see it. 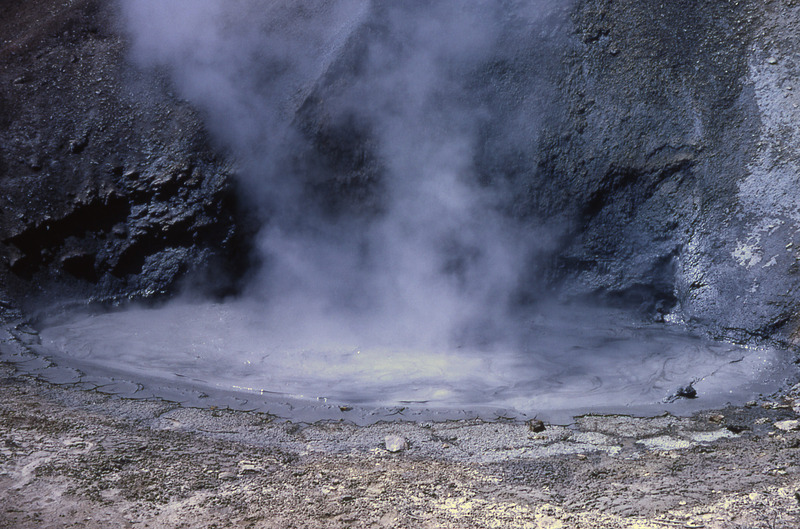 Eruptions can last up to 12mins and are made up of bursts of large amounts of water from the surrounding pool rather than one long continuous eruption. Eruption prediction times here. Again, not too creative on the names – the geyser is located right next to the river in the upper basin. It erupts every 5-7 hours in a 75ft spray that arches over the river. Depending on the sun, these eruptions can create rainbows which is really magical in this beautiful place. Even without the eruptions, it’s an interesting geyser to see as it bubbles smaller amounts of water down the banks and into the river. Eruption prediction times here. A pretty small basin between the upper and lower basins. There’s not much area to cover here and all of the features are clustered together along one short boardwalk. It gets very crowded since there’s a lot of land in this area. When walking along the boardwalk be careful not to fall into one of the scalding hot springs! You literally walk right up to the edge and there are no guard rails. Oh my god so beautiful. I would put The Grand Prismatic Spring as the #1 must see thing out of all of the must see things on this list. Larger than a football field, it’s the largest hot spring in the US and the third largest in the world. You can’t take a bad photo of the Spring. The orange, yellow, and blue colors are amazingly beautiful and are a beautiful juxtaposition from the green trees surrounding the area. The Grand Prismatic is so large you can’t fit it all in one photo without using a panorama setting or fisheye lens, especially when you’re getting so close to the edge. The Midway Geyser Basin isn’t a very large area and if you’re going to see the spring, you’re pretty much going to see all of the other attractions in this area too. Of note is the Excelsior Geyser which is visible right after crossing the bridge to the Spring. The Excelsior Geyser doesn’t erupt so much as it just flows over the side of the hill into the river adding 5,800,000 gallons of nearly boiling water to the river each day. Five square miles of around 100 geothermal features including fumaroles, hot springs, geysers and mud pots. That being said, I would put this more towards the bottom of the list for geothermal areas to see. Some of the other areas like Norris and the Upper Basin are more impressive. A sure thing, Clepsydra Geyser is in a near-continuous state of eruption, sometimes hitting 45 feet, so if you haven’t seen a geyser yet, you can’t go wrong here. It’s also a pretty geyser with a range of orange and blue colors. 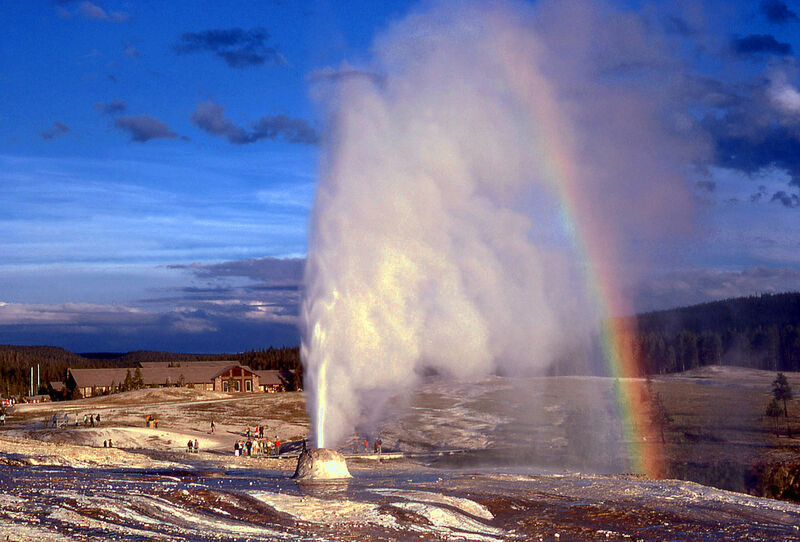 With the vent of the geyser located in the center of a large terraced pool, the Great Fountain Geyser is the only predictable geyser in the Lower Basin erupting every 9 to 15 hours. Probably not one you want to hang around for, but if you’re in that time frame it’s worth a peak. 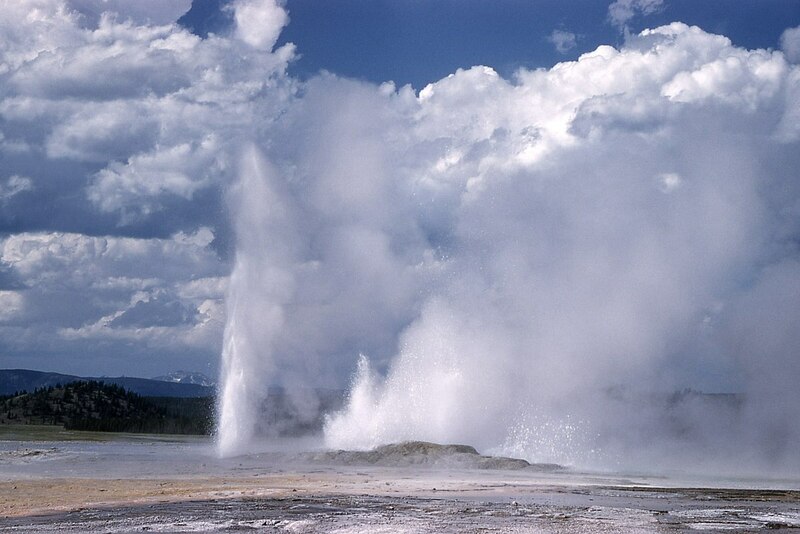 The Great Fountain Geyser is also connected to the Clepsydra Geyser – when Great Fountain erupts, it’s one of the only times that Clepsydra stops erupting. Erupts from one of the largest cones in Yellowstone for about 2 minutes roughly every 15mins to 3hours. Eruptions can be 30ft high, plus the 20ft cone, makes it a very tall and pretty geyser. Eruptions can be erratic, but you might be able to catch it while waiting for Great Fountain. Yellowstone’s most easily accessed large group of mud pots. Created by the acidity in the steam which breaks up the surface rock into clay. The steam then continues to push up through the clay, creating a “paint pot”. The Artists Paint Pots are the most well known mud pots in Yellowstone. Bubbling with a variety of colors of pinks, beiges, and grays from the iron oxides, they are isolated in the lodgepole forest at the end of a half mile hike and average around 185°F. Eruptions only amount to a few feet of water, but the cone that the geyser erupts from is over 8ft tall. This is the biggest attraction in this area and is regularly puffing with steam. The size of the cone and the steam causes a constant, low hissing sound to come from the geyser. The hottest geothermal area in Yellowstone! 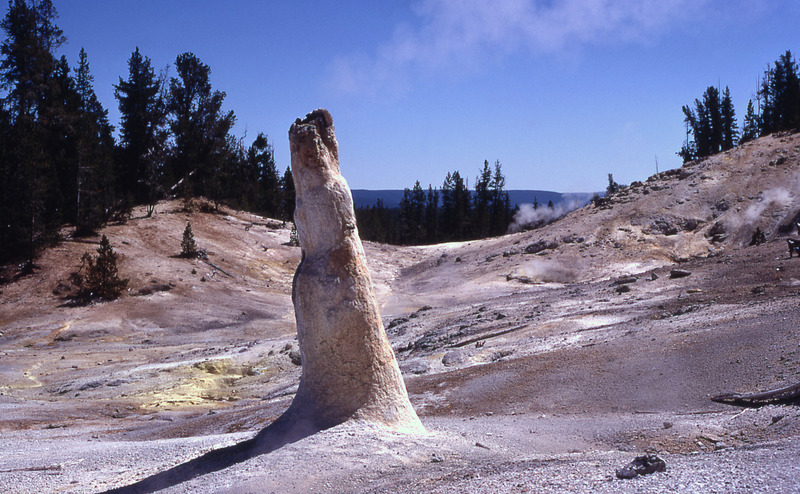 The geothermal features in this area are hotter than any other areas in the park. Very few of them are under the boiling point, which at this elevation of 7,600 feet, is 199°F. There are two separate areas to the left and right of the main entrance/visitors center: the Porcelain Basin (a milky pastel landscape that looks like some sort of psychedelic moon) and Back Basin (full of geysers). You can see the entire area via the 2 1/4mi boardwalk trail. Following the path to the right of the entrance and then right again along the boardwalk up towards the top of the ridge will give you an excellent view of Porcelain Basin Hot Springs. The siliceous sinter mineral deposits here is what gives this area it’s milky color. This is the fastest changing area in the basin and is a wash of unique colors and bubbling hot springs. A geyser where the water swirls in its crater while erupting. Unfortunately, it has been dormant for years, but the orange-yellow iron oxide deposits still make it one of the most colorful features in the Porcelain Basin. The largest known acid-water geyser with a pH ranging from 3.3 to 3.6 – which is almost as acidic as vinegar. Acid geysers are very rare and the largest concentration of them are in the Norris Basin. The Echinus geyser has eruptions that explode 40 to 60 feet lasting from 4 minutes up to 118 minutes. At one time this geyser erupted every 35 to 75 minutes, but now it’s every 2 hours-4 days. The world’s tallest active geyser consistently shooting water more than 300 feet during major eruptions. You can see the steam from this geyser towering over the treeline from the surrounding areas. The minor and major eruptions are completely unpredictable, so just hope to get lucky. Located near the northern entrance to the park, Mammoth Hot Springs is unique in that it’s huge (probably how it got its name) and several of the attractions seem to just blend together as opposed to other areas where the geysers are more separated. The entire area is terraced with an upper and lower boardwalk where visitors can experience around 50 hot springs. 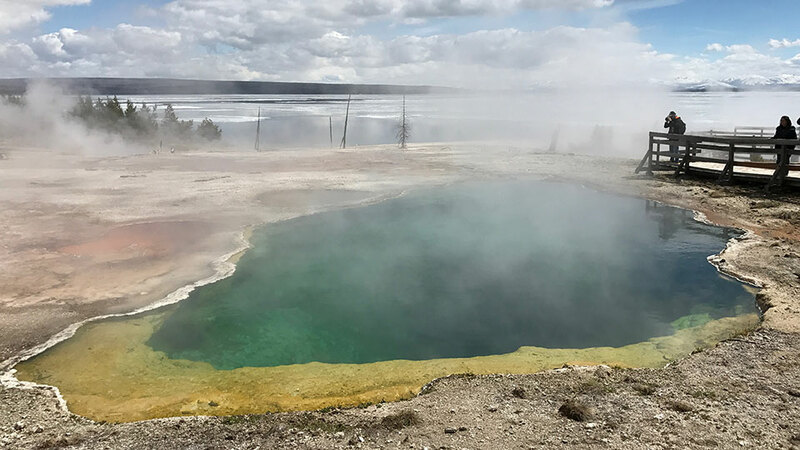 The area continues to grow faster than other areas of the park as hot water descends through old limestone deposits which is relatively soft and malleable. Bacteria has turned some of these terraces into a variety of colors and the entire thing looks like the inside of a cave. The big main iconic terrace at the “front” of the hot spring. You really don’t need to go looking for it – you can’t miss it. Best visible from the lower boardwalk which starts at the base of the terrace and then allows you to walk up into/alongside of it to view small pools and other hot springs located within the terrace. This one you will have to seek out since it’s more “in the back” of the hot spring, behind the main terraced area. Orange Spring Mound is full of bacteria and algae which give it an orange color (hence the name). It looks almost like a cross between a giant termite mound and one of those Asian water flowing over rock serenity/meditation things since running water is constantly flowing over it. It’s located along the Upper Terrace drive – which goes “into the woods” above the main hot spring area, and as such is less trafficked than the terrace main attraction. One of the best locations to view wildlife and is also full of geothermal activity, even if not really known for it. It has boarded trails allow visitors to get very close to all the bubbling geothermal features which are scattered throughout the area (some of which can get pretty muddy). Close to the center of the caldera (which is still an active volcano vent – don’t worry the volcano is dormant even if the vent is not) are a series of muddy hot springs and fumaroles known as the mud volcano. This mud volcano did erupt at one time but by the time the park was established in 1872, it had apparently blown itself up and became a crater filled with bubbling mud, which is what you’ll see here today. A unique geothermal area as it sprawls alongside Yellowstone Lake. This is the largest geothermal area along the lake (but one of the smallest in the park) and in fact many of the features are underwater. The bay is a caldera that was formed by a volcanic eruption 174,000 years ago (which isn’t that long ago in the scheme of things). The geysers in this area pour 3,100 gallons of hot water into the lake every day. This plus the heat from the underwater hydrothermals can melt ice on the lake’s surface. The deepest known pool in Yellowstone at 53ft. It’s a hot spring averaging around 172°F. It ranges in colors of dark greens to blues to browns depending on the bacteria that grows throughout the year. The colors of the waters are really beautiful and give the pool the illusion of being bottomless – hence the name.